It serves as a recreational and social focal point providing space for gathering, informal activity, and play. 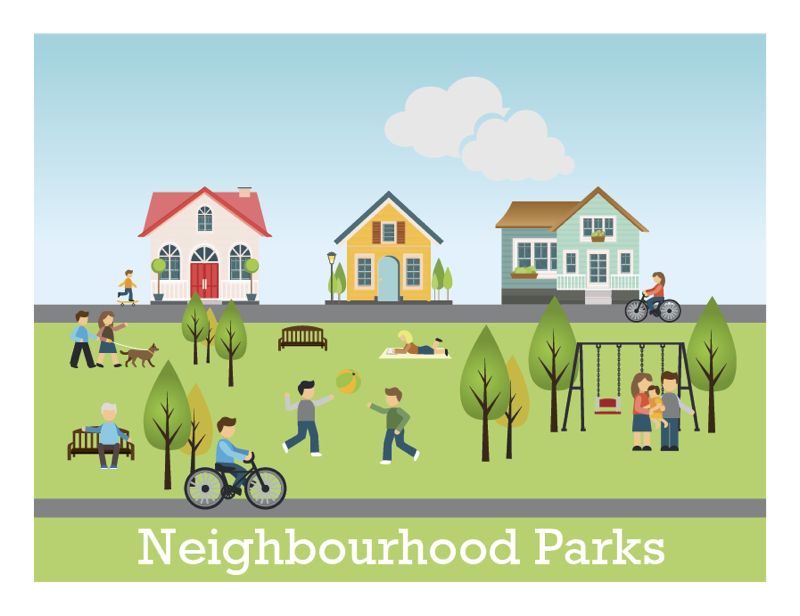 Examples of neighbourhood parks in the City of Fredericton are Reading Street Park and Lincoln Heights Park. To guide its development, the City is creating an Upper Hanwell Neighbourhood Park Master Plan. Understanding the demographic make-up of a neighbourhood is important for ensuring that park design meets the diverse needs of the resident population. The following statistics provide a brief overview of the people who live in surrounding neighbourhoods and will recreate in Upper Hanwell Neighbourhood Park. Park design is successful when all of the elements being considered for use in the space have a clear purpose. In a neighbourhood park, these elements can be natural such as the land and trees, built such as ball courts and walking trails, and include supporting amenities and minor structures such as benches and gazebos. All of these individual elements must be coordinated to create balance and harmony in the space. Together, they must flexibly support a variety of activities for people of all ages and abilities, and can adapt to changing demographics. This neighbourhood park master plan is based on the results of public session consultation. Overwhelmingly, residents want to place passive recreation and social activity in the park without significantly impacting the site’s natural attributes. In fact, activity should celebrate the natural attributes! The following summarizes the BIG IDEAS for this site. Wherever possible, play and social elements must be based on the notion of nature play, or natural playgrounds. The site is created to provide residents of varied ages to meet, greet, socialize and play on their own terms. 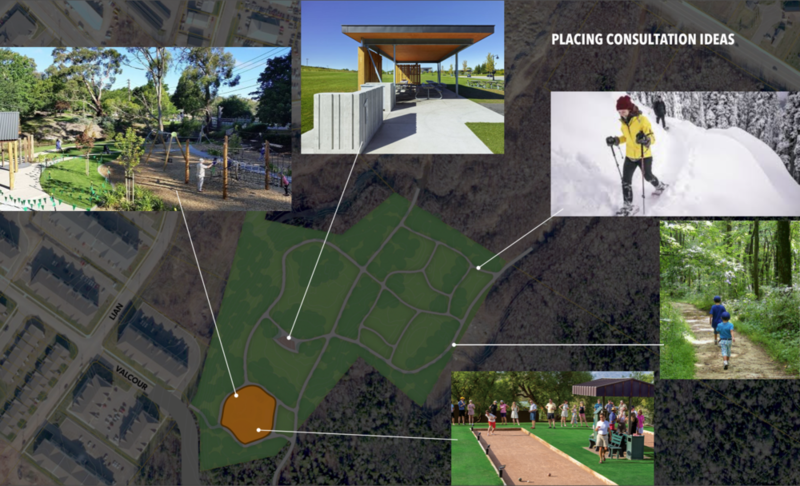 Thus, youth-based play structures and adult-based bocci ball courts are connected with a series of nature-based seating, balancing and climbing amenities. Any amenities should support both activity and social purposes. For example, seating can double as a balancing log. The activity and social area should form the heart of the site, close to the park entrance. From this location, the reminder of the site should be accessed on trails forming a series of loops that provide local walking, biking and snowshoe options. Residents desire a facility that can be utilized on an all-season basis. Thus, the natural play activities, shade structures and in-park trails should be accessible during the winter season by snowshoe or fat bike. The placement of the central activity area should be chosen in order to ensure that future residential, academic or other development can see into the site. Upper Hanwell Neighbourhood Park capitalizes on a magnificent natural and topographic setting to provide neighbourhood residents with thematically appropriate passive recreational activity. Park amenities are designed and placed to bring all ages together for shared social and play reasons. We want to hear from you! As a next step in the public consultation process, the city is asking interested residents to share their thoughts on Upper Hanwell Neighbourhood Park Master Plan concepts. The image below locates each of these nine development concepts in the 5-hectare park. We thank you for your time and assistance! If you would like to receive project updates, please submit your email address.